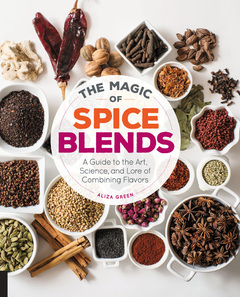 Aliza Green’s The Magic of Spice Blends: A Guide to the Art, Science, and Lore of Combining Flavors is for anyone looking to improve the flavor profiles of their cooking or branch out for more flavorful, interesting and stimulating dishes. She will educate you about types of spices, how to prepare them and how to use them in your cooking to wow your guests and leave your mouth wanting more. One subset of spices she discusses in her book are Asian spice blends. This covers a far-reaching stretch of spices include, cinnamon, ginger, star anise, wasabi and many more. Explore the sweet, spicy and powerful flavors of this region of the world, and get inspired with these three recipes from the book. Togarashi, the Japanese word for “chiles,” is a group of chile condiments that bring out the clean, simple flavors of Japanese food. Shichimi Togarashi is also called Japanese seven spice because seven ingredients are generally used. It works well with fatty foods such as unagi (broiled eel), tempura-fried foods, shabu shabu (small bits of food cooked in rich broth), noodle dishes, and yakitori (grilled dishes). Nanami togarashi is a close cousin. Nori is sheets of dried seaweed, made by a process that resembles papermaking and is available in Asian markets. 1. Heat a dry skillet over medium heat. Add the sancho or Sichuan peppercorns and toast until fragrant, about 1 minute. Remove from the pan and reserve. 2. Using the same skillet, toast the tangerine peel, nori, sesame seeds, and poppy seeds for about 1 minute, or until fragrant. Remove from the pan and reserve. 3. Using the same skillet, toast the chile powder over medium heat for 30 seconds. Cool and then combine with the toasted spices and the garlic. 4. Grind all together to a chunky consistency. Store in an airtight container, refrigerated, for up to 1 month. Udon noodles are thick, smooth, chewy wheat flour noodles usually served in soup. Here we combine the noodles with smoky shiitake mushrooms and juicy bok choy. A lastminute sprinkling of shichimi togarashi, roasted peanuts, and scallions adds a burst of flavor and welcome crunchy texture. Serve the noodles in large Asian-style soup bowls for a one-dish, vegan-friendly meal. 1. Remove the stems from the shiitakes and reserve, if desired, for another use, such as mushroom stock. Slice the caps thinly and reserve. Trim the bok choy, slice thinly, and reserve. Cut the snow peas into thin julienne strips and reserve. 2. When ready to finish the dish, bring a medium pot of salted water to a boil. Cook the fresh udon noodles for about 2 minutes, or until just tender, then drain and reserve. If using precooked noodles, dip the udon into the boiling water for 30 seconds to soften and then drain. 3. Meanwhile, heat 1 tablespoon (15 ml) of the oil over high heat in a wok or large skillet. Add the shiitakes and sauté until crisp-tender, shaking the pan frequently. Remove from the pan, add the snow peas, stir to wilt lightly, and reserve. Repeat with the remaining 1 tablespoon (15 ml) oil and the bok choy and remove from the skillet. Add the noodles, soy sauce, vinegar, and sesame oil to the pan and heat to boiling, shaking to combine. At the last minute, toss with the shiitakes, bok choy, and snow peas. 4. Transfer the noodles mixture to individual serving bowls. Sprinkle with the Shichimi Togarashi, peanuts, and scallions and serve piping hot. The galangal (or galingale) called for here is a first cousin to ginger and an important seasoning in Southeast Asian cooking, used to flavor curries, soups, and stews. It is more pungent than ginger, with a sharper bite and a tangy flavor reminiscent of hot mustard. Fresh galangal is occasionally found in natural foods and Asian markets, and may also be called laos (its Indonesian name). Substitute fresh gingerroot if galangal is not available. 1. Trim both kinds of chiles and discard the stems and seeds. Soak the chiles in warm water to cover until soft and pliable, about 30 minutes. 2. Heat a skillet over medium heat without any oil. Add the coriander seeds and toast until lightly browned and fragrant. Remove from the skillet, cool to room temperature, and grind to a slightly chunky powder. In the same skillet, heat the oil and cook the shallots and sliced garlic over moderate heat until lightly browned, about 8 minutes, stirring often. 3. Combine the wild lime leaves, lemongrass, galangal, cilantro root, and turmeric root and finely mince together. 4. Drain the chiles, reserving the liquid. Using a food processor, purée the chiles to a chunky paste, and then add the ground coriander, shrimp paste, roasted shallots and garlic, and the wild lime mixture, adding about 1 cup (235 ml) of the reserved chile soaking liquid as needed to process. 5. Remove the mixture from the processor and add the lime juice, sugar, and sea salt. Transfer to a tightly sealed container and store, refrigerated, for up to 1 month. This impressive, quickly prepared meal accents dense, sweet sea scallops with warm, spicy red curry paste scented with orange zest. Chicken breast cubes, shrimp, or firm fish, such as albacore tuna or swordfish, make good substitutes. The potent flavor of the red curry paste is tempered with coconut cream to produce a rosy-pink sauce that’s aromatic and spicy but not too fiery. and cook until fragrant, about 2 minutes, stirring constantly. Add the orange zest and juice, coconut cream, and salt to taste. Bring to a boil, reduce the heat, and simmer until the liquid is slightly reduced and thickened. Reserve. 2. Heat the remaining 2 tablespoons (30 ml) oil in a wok or large skillet over high heat until it shimmers. Season the scallops with 1/2 teaspoon salt and a large pinch of pepper. Add the scallops to the pan and sear on one side until browned, then turn over and sear again until barely opaque, about 3 minutes total. 3. Stir the Thai basil into the curry sauce and spoon onto serving plates. Arrange the scallops on top, sprinkle with the scallions, and serve immediately accompanied by cooked jasmine rice. This fresh-tasting curry paste gets its heat from lots of small hot green chiles; its fragrance from lemongrass and lots of fresh green herbs such as cilantro, mint, and Thai basil; its earthiness from shallots and garlic; its pungency from fish sauce and shrimp paste; and its slightly medicinal pungency from galangal root. Though, its green heat is reminiscent of spicy green Yemenite Zhoug. Place all the ingredients in a food processor, chopper, or blender and process to form a thick, chunky paste. Store in a tightly sealed container, refrigerated, for up to 2 weeks, or freeze for up to 3 months. This quick-cooking dish is infused with Thai flavors of lemongrass, ginger, and hot, herbal green curry paste. Now that Asian ingredients such as fresh lemongrass, coconut cream, and gingerroot are easily found even at the supermarket, this fragrant sauté is easy to make. Choose wild American white or pink shrimp or Mexican white shrimp for firm texture and sweet flavor. Avoid stronger and mushier black tiger shrimp. Serve over steamed jasmine rice, which will soak up all the delicious juices. 1. Devein the shrimp if desired—this is not usually necessary if the shrimp are smaller— leaving the last tail shell section on. 2. Heat the oil over medium heat in a large skillet, preferably nonstick. Add the shrimp and cook for about 2 minutes, or until partially opaque. Add the shallots, garlic, and lemongrass and sauté for about 1 minute, or until the shrimp are just cooked through and lightly curled up. Remove the shrimp from the pan and reserve. Add the wine to the skillet and cook over high heat until the liquid has mostly cooked away. 3. Add the Thai Green Curry Paste, coconut cream, and shredded coconut. Bring the mixture to a boil, and cook over moderately high heat until thickened enough for bubbles to appear all over the surface, about 3 minutes. Just before serving, return the shrimp to the pan, toss to combine with the sauce, and add the Thai basil. Serve immediately over rice. A pinch of this and a dash of that, and you’ll be creating distinctive and delectable flavors in every dish!Today, more than ever, we have access to almost every spice and herb imaginable. But it’s the careful blending of herbs and spices that is the true art of the spice handler. Chef Aliza Green guides you through the principles of choosing, working with, and blending spices. Join the fun of creating personalized spice and herb blends and knowing just what goes into them–no ancient, bitter, musty dust here! Find resources on where to purchase great quality herds and spices, even organic, non-irradiated. You can even grow your own and use them to make those wonderful spice blends. Along with background information on the history, culture, and culinary uses of each blend, The Magic of Spice Blends includes recipes and variations for 50 spice blends and an additional 50 recipes featuring the blends, including: Spicy Moroccan Steamed Mussels with Charmoula (Africa); Vietnamese Chicken Bahn-Mi Sandwich with Chinese Five Spice (the Far East); Swedish Gingerbread Cookies (Europe); Grilled Vadouvan Salmon with Date-Tamarind Chutney (India); Watermelon, Labne, and Mint Salad with Lime-Advieh Dressing (the Middle East); Louisiana Spicy Boiled Crayfish (North America); and Jerk-Spiced Turkey Wings (the Caribbean, Mexico, and South America).